Home Our Garage Door Services Garage Door Openers Which Brand Should I Choose for My New Opener? Choosing the best opener for your garage door can be an arduous task; there are so many different factors to consider. Asides from budget, it's important to consider efficiency, durability as well as functionality and appropriateness for your household. Genie produces some of the most durable and efficient openers on the market. They are known for producing powerful, quick, intelligent, and easy to use units such as the TriloG 1500. This model runs with a 1 horsepower engine, motion detector lights, and operates at a rate of 12 inches per second. Many Genie openers are also equipped with Intellicode Access Security Systems that greatly boosts the security capabilities of these models. There are also a variety of accessories on offer such as battery backups that enable the system to operate even when the power is down. This is another brand that we recommend to our customers. Like Genie, LiftMaster is famous for reliable products that deliver results in terms of efficiency, durability, and security. They come with MyQ technology, enabling you to control your security lights from afar through the use of a smartphone, laptop or computer. 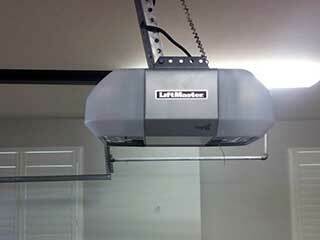 When it comes to security features, we think Liftmaster offers groundbreaking features. For example, Security+ 2.0 generates a new code each time the remote is used, making it more difficult for intruders to gain access to the code and open the door with a different device. Popsilock is another security feature which involves electronic monitoring against forced entry. The Timer-To-Close feature closes the door automatically in case you forget to do it yourself. Alert-To-Close, on the other hand, serves as an alarm system which gives off audible and visual warnings when the door is used unexpectedly. In addition to the above all automatic openers today should come equipped with safety sensors which automatically cause the door to reverse if they detect something in its path. This is a great feature designed to prevent accidents. Some Genie and LiftMaster products also come with motion detectors which automatically trigger the lights to turn on so you don't need to fumble in the dark. In summary, both Genie and LiftMaster offer state-of-the-art safety features as well as durability you can trust. However, there are more questions to consider than brands, such as whether a chain, belt or screw drive opener would be more appropriate for your home. Our team at Garage Door Repair Burleson can guide you through all the options available and help you choose the right model for you.